and ends at 11:59pm MT on October 23rd. Stampin' Up! 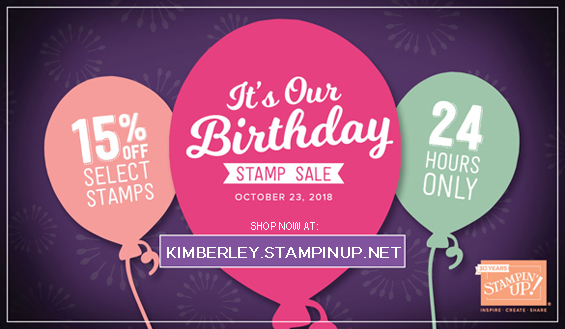 is celebrating its 30th Birthday this year, and you can celebrate by choosing from 30 different stamp sets, each priced at 15% OFF for ONE DAY ONLY! NOTE: Many of these stamp sets are also available as BUNDLES (with a punch or die set) at 10% OFF the price of the TWO items in the Bundles. Please be aware that purchasing the stamp set and tool separately may be slightly MORE expensive (even with 15% off the stamp set) than buying the BUNDLE together at 10% OFF. 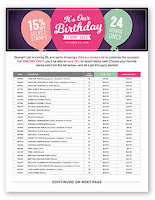 Please do the math for yourself.